UP Police Pay Slip under Chief Minister Aditya Nath Yogi Government UP Police Constable, Sub Inspector Bhatta, Diet Allowance per year is Rs 3500 Per Year. Aspirant who are going to apply for UP Police Constable Bharti 2018 from 8th December they always checked about UP Police Constable Pay Slip and UP Police SI Pay Slip 2018 so here is the information that Rs 3000 additional payment transfer to all UP Police Official employee that granted original UP Police Vardi 2019. UP Police Bhatta for Cycle & Vardi Bhatta: UP Cabinet has taken decision to extend the UP Police Bhatta for Cycle and Vardi Police in multiple manners. Now if you are UP Police employee and holds important constable posts than this news of UP Police Bhatta will make excitement in an entry level. Under Generalization process and Modernization of UP Police Constable the UP Police Vardi Bhatta and Cycle Bhatta Increased. 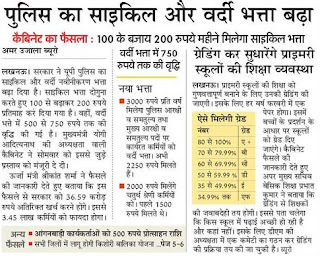 Cycle Bhatta of UP Police Increase from Rs 100 to Rs 200, while Vardi Bhatta mein 750 exceeded from Rs 500. 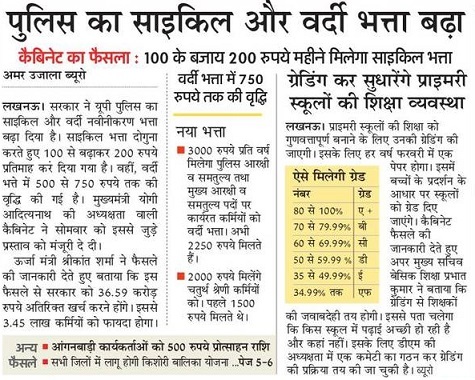 So total budget passed for UP Police Constable is Rs 350 per Employee. Below are some important points under. UP Police TA DA Allowance in 2019: There is no comparison of up constable salary with other states MP Rajasthan Bihar Jharkhand because every holds are allowed, permission to create salary of their respected constable in their own meanings, definition. UP Police Group Employee Bhatta: Latest news 3 December 2018 is Rs 2,000 per year Vardi, Cycle Bhatta for Group d employee in UP Police. Previous Bhatta of UP police group d employee is rs 1500.